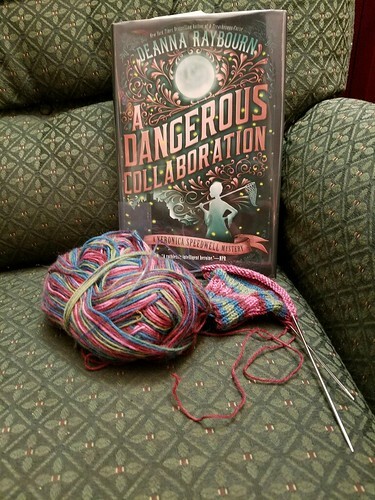 I picked up a new book at the library earlier this week — Deanna Raybourn’s A Dangerous Collaboration, the latest in the Veronica Speedwell mystery series. Set in Victorian England, the series is a gender bending homage to Sherlock Holmes, although Speedwell’s Holmes is far more equaled by Stoker’s Watson than is usually the case. This addition to the series is set on an island off the Cornish coast and features a castle with a poison garden. I’m sure we can all see where this is going to go. And I’m excited for it to do so. I’ve been in a reading slump recently, so the area around our couch is currently littered with books that I’ve dipped into, expressed interest in continuing, and then put aside for something new, which also fails to snare my attention fully. Less than 24 hours after starting this book, though, and I’m past the treacherous waters of the 50-page mark, so I’m hopeful. I have also been carrying on with Ladee Hubbard’s The Talented Ribkins and Questlove’s Creative Quest on audio. I’m narrowing in on the halfway mark for the former, which remains both interesting and vague, as our septuagenarian narrator is slow to reveal important details from the past to his niece and his readers. The latter audiobook is fine, and Questlove just revealed the importance of the Stevie Wonder episode of The Cosby Show to many of our now middle-aged hip hop pioneers. I did not get caught between sock #1 and sock #2 for my stripey stockinette pair. This is the first second sock of 2019, so it’s a pretty momentous knitting occasion for me. I’m hopeful we’ll be able to carry on quickly through. And I just have the toe of the first of my Smock Madness sock to finish before moving on to the second one of that pair, as well. Progress on my shawl has stalled, but it has been suggested to me that if I complete some major item on my to-do list that that feeling of accomplishment might carry me through some of the other tasks, so I may put some energy into wrapping it up. Plus, we’re getting into the weather where I can start going out with just a tshirt and shawl into the evening, so this would be a perfect time to get it off the needles and onto my shoulders. Want to see what other people are reading and crafting? Head over to As Kat Knits.